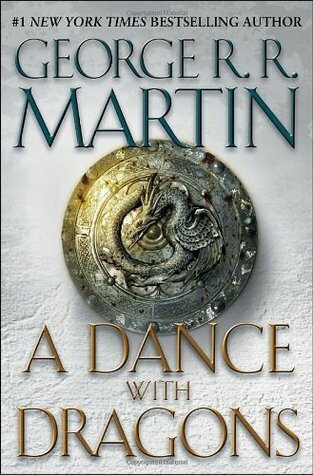 Not all men were meant to dance with dragons…but Daenerys Targaryen can!In the fifth book of the A Song of Ice and Fire series, we find ourselves across the Narrow Sea waiting to see if Daenerys Targaryen will ever make it back to Westeros and reclaim her birthright! In A Feast for Crows, we met a lot of new characters along with a few familiar favorites. Since AFFC and ADWD were supposed to be one long book, I expected to see some overlap in the timeline and more of our fav characters in this book….and I was right, many of my fav characters were back! I will try to make this review as spoiler free as possible, but it is difficult not to include references from the previous three books but I will do my best but consider yourself warned. The war for the Iron Throne rages on in Westeros with Tommen still the reigning monarch. Cersei remains a prisoner and still holds onto hope that Jamie will appear and save her from her fate….but Jamie is still in the Riverlands and last seen with Brienne of Tarth. At the Wall, Stannis Baratheon and his red priestess, Melisandre, occupy the Wall. Jon Snow is still Lord Commander and at the mercy of Stannis and his men. Stannis and Jon have an uneasy relationship, Jon needs more men for the Wall and Stannis needs more lords to bend the knee to his cause. After burning Mance Rayder, Stannis gives the wildings a choice…..bend the knee and serve the Nights Watch or take their chances beyond the Wall….which means, take they chances with the Others….most bend the knee. So Jon has his men, and Stannis heads south to claim The North (including Winterfell) and in doing so, hopes to gain the support of the mountain clans. Lady Melisandre remains behind at the Wall with Jon Snow, in her flames she starts seeing more and more images to do with Jon. She confesses some of her visions to him and gives him council but he is not quick to trust her. Bran continues his journey beyond the Wall with his group of unlikely followers (Meera, Jojen, Hodor, and Coldhands) looking for the three eyed crow. Bran has the gift of skinchanger and he is a greenseer, the three eyed crow helps Bran understand his gifts and how to use them. Theon Greyjoy has been captured by the Bolton’s and is their captive at Winterfell. He endures excessive amounts of torture at the hands of Ramsey Bolton. Ramsey is meant to marry “Arya Stark” and claim Winterfell as his own. The Bolton’s have a girl matching Arya’s general description and age but need someone to confirm her identity which is where Theon comes in. He immediately knows that the girl is NOT Arya Stark but fears for his life if he doesn’t say she is. In Braavos the real Arya Stark remains in the service of the House of Black and White. She struggles to leave her true identity behind and become a servant of the Many-Faced God. In the Free Cities, Tyrion Lannister is making his way to Daenerys Targaryen. There is a price on his head in Westeros so he needs somewhere to be and the Free Cities seems like as good a place as any and why not serve a new queen….a better queen…..a dragon queen. Along the way he meets Jorah Mormont who plans on taking the Imp to Daenerys in hopes of winning her favor. In Slaver’s Bay, Daenerys is still trying to figure out a way to Westeros. The new head of her Queensguard, Ser Barristan Selmy, is trying to convince her that she must leave Meereen and figure out a way back to her home and her throne. But she refuses to leave her people. She agrees to wed a Meereen husband of high birth, but just before the marriage, Quentyn Martell of Dorne arrives with a piece of paper claiming a marriage pack made in secret between Dorne and House Targaryen. But Dany has already given her word to the Meereen people and in turn refuses Quentyn. The next thing we know….there are three really angry dragons on the loose and the audience is left with a couple of HUGE cliff hangers….with no tentative publication date for the sixth book in sight….readers are left with a zillion questions! Honestly….not a lot happened in this book. I know it sounds like it but really there were no epic battle scenes….no crazy weddings….no giant feasts. Just a lot of background info and plot building but a lot of it I found very interesting. This book made me want to know more and more about the background of many of the lesser known characters. For instance…I really want to know more about Lyanna Stark now. What was the true nature of the relationship between her and Rhaegar Targaryen? I also want to know more about Melisandre and her religion….how does it all work? Where do her powers come from? I want to know more about the House of Black and White and the Many-Faced God. With this book I read a lot more on the Ice and Fire Wiki that I have with other books…mostly trying to learn more about some of the other characters and the religions. I was really intrigued by what’s happening with Jon Snow and the visions that Melisandre is having about him in the fires. Could he be Azor Ahai and not Stannis? Could Melisandre’s visions have been read wrong? There are so many questions surrounding the prophecy, Jon parentage, and Melisandre’s visions and I for one am DYING to know more about this storyline. I loved the direction that Bran’s character is heading. I think his greenseeing is going to play a huge role in the future of the series. I think through this, a lot of questions will be answered and explained….especially since he can see things that happened in the past. For me personally, I don’t really care too much about what’s going on in the Iron Islands or in Dorne….and I don’t really care too much about the Free Cities but I know they are relevant to the story….I am just partial to the North and the Wall I guess. I was hoping we would find out more about Jamie and Brienne….I love those two, especially together, so I really wanted to hear more about them but there was only one chapter from Jamie’s POV which was disappointing. Sansa was also not in this book which was frustrating….what’s going on with her in the Vale? While this book lacked a lot of the luster that the first three books had, it is still relevant to the overall plot and it really begins to fill in the gaps and questions that have been happening in the plot since the beginning. While this book might not have been as action packed as some of the others, it was still the ‘necessary book’. Since AFFC and ADWD were supposed to be one long book, it makes sense that not a lot is happening yet. I really think the next book is going to be epic….we have now had two books since ASOS and I think it’s now time for things to start picking up again. I just hope I don’t have to wait like five years to read the next installment! Obviously, if you love the series you will read this book….it’s solid but not as good as some of the others but that doesn’t mean I didn’t enjoy it. I’m just ready for Dany to cross the Narrow Sea and get to Westeros already….I think I’ve been saying that for at least three books now! Bring on the dragons! I want so much to read this series…but I’m waiting until all of the books are published. I watched how irritated my husband got when he finished the last one that’s been published, and I just refuse to go through that. Haha!